The Best Alternative To Hair Bobbles Ever! I swear, these are the best alternatives to hair bobbles ever! These bad boys are called Invisibobbles and they are amazing! When I got my hair cut at Christmas my hairdresser very kindly decided to throw in a little freebie for me- it was a pack of three Invisibobbles. Ever since I got them they have been my absolute favourite thing in the world! I have been recommending them to all my friends, especially those with thick or long hair like me! Although they are a little more expensive initially- £3.75 for three - I really think that they are worth it in the long run. If you have long or thick hair you know how easily normal bobbles snap and stretch out beyond use. Those cheap packs of bobbles can easily add up to a decent amount of money in the long run. Plus normal bobbles disappear constantly! Well, with the Invisibobbles last far longer! I am still on my first one since Christmas and it hasn't broken. Plus because they are slightly bigger than a normal bobble they are way easier to keep track off. I have no doubt that these will save me money in the long run! 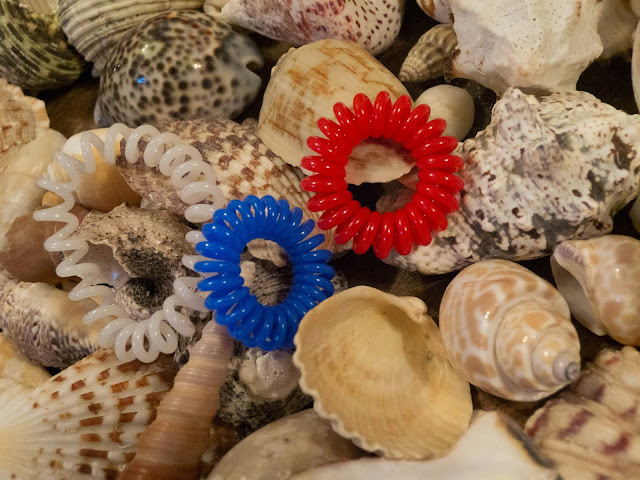 The Invisibobbles are marketed to avoid breaking your hair, instead of using tight elastic around your hair the plastic grips far better so it will stay in your hair without being tied so tight. I'm not a professional so I don't know if this actually works or not! What I have noticed though, is that these bobbles are really great at not leaving kinks or marks in your hair after using them! Very useful on the go! If you want to try Invisibobbles out then you can get them from places like Boots for £3.75- here in black and here in transparent. Have you tried Invisibobbles before? Let me know what you think down below! I won some of these in a giveaway a while ago, but not tried them out yet. Try them! They are amazing! They are so good, I don't know how I live without them these days!